My first exposure to the legend of Robin Hood, as I suspect is true for a good number of people, was of the “Every town has its ups and downs…” variety where Robin is portrayed by a very dashing… er… fox, literally. Since then, I’ve always loved the Robin Hood stories. There’s just something so romantic about the whole idea… be it about foxes or not. It’s the action, the adventure, the idea of the little guy fighting back against “The Man.” The concept of challenging social injustice and corruption; protecting your own. It’s about fighting with brains as well as brawn, and it’s not just about “fighting” as it is “fighting with style.” There’s a sense of showmanship that’s always surrounded the Hood; he not only one-ups the Sheriff, his goons, and Prince John, but he does so with a well-placed arrow, a jaunty tip of his hat and an infuriatingly charming smile that inspires his people to adore him as passionately as his enemies hate him. But above all (in most of the legends, anyway) Robin Hood is a love story – for the love of a lady, for the love of his people, and for the love of king and country does Robin Hood fight. Overly romanticized? Eh. Maybe. Probably. But I love it, and it’s a legend that’s endured because it is built on a foundation of concepts that are timeless. So upon learning that Gaughen’s Scarletwas a reimagining of Robin Hood, I just knew I had to get my hands on it. Will Scarlet becomes a female character? Add in confusing feelings for our heroically heroic hero and it was a done, done deal. Scarlet. I love Scarlet, and this both shocks me and, well, doesn’t. Outwardly, she is possibly one of the most acerbic and standoffish characters I’ve read in quite awhile. She’s got this wonderful surety and confidence to her, but she’s emotionally detached, and purposely so, from the people in her life. Those who try to get close are continually pushed away, met with coldness and stoicism. Inside however, she’s a mess of fear, guilt and uncertainty. And she does care; she does, even though she maybe wishes she didn’t. She sees herself as undeserving of the things she desires, paying eternal penance for the sins of her past life — she shoulders blame unnecessarily, feels every failure keenly. Whether she realizes it or not, Scarlet’s incredibly decisive, courageous, selfless, practical, pragmatic and resolute. Scarlet is looking for purpose, and in Hood’s gang of outlaws, she’s found it. Scarlet tells us her story in first person giving the reader an unobstructed view of her internal struggles. It also gives the reader the opportunity to appreciate Scarlet and her unusual, rough way of speaking and phrasing things. At first it took me a little aback, but I soon got used to it, and began to love it. Just because it’s unpolished doesn’t mean it’s not beautiful – a diamond in the rough, just like Scarlet herself. Rob. I liked Gaughen’s potrayal of Robin more than most I’ve read about or watched onscreen. Rob is definitely heroic (to be expected), a bit of a showmanship (required), a little hot-headed, at times, but he’s a fair and strong leader — passionate but not dangerously over-zealous. Robin is good at recognizing people’s unique strengths and then utilizing them to full advantage. He genuinely has a heart for those under his care, or rather, those he considers under his care. It’s not just about one-upping the Sheriff or Gisbourne, it’s about taking care of his people. And the people, for the most part, love him in return. He demands loyalty and respect from those in his little rebel band, because he needs to be able to trust them implicitly. However, this proves slightly problematic because of Scarlet. Rob knows Scarlet is hiding something, something that’s affecting her choices and performance within their little band, and until Scarlet trusts him with her secret, he can’t fully put his trust in her. Much. Much is just… adorable. He’s the guy in the band that everyone loves, the one everyone always gets along with — the beloved kid brother. While he’s not as skilled in combat and thieving as the rest of them, Much’s talents lie in the scientific, the mechanical. Little John. Loud, boisterous and passionate, John’s the kind of guy who’s got a girl in every pub. He’s extremely self-assured, thrives on danger, he’s a bit aggressive when it comes to obtaining something he wants… and that “thing,” at the moment, appears to be Scarlet. Romance. As I said before, Robin Hood has always been, at it’s heart, a love story – an epic romance. I’ll be the first to admit that the implied romance between Scarlet and Robin in the blurb was a major factor in why I wanted to read this book. Not Marian, but Scarlet as the love interest! And I just love how Gaughen reimagines one of literature’s most enduring love stories. It’s every bit as compelling as the original romance and has the potential to become quite epic in its own right. Story. All of the elements I mentioned above that make this story such an enduring one? They’re all here. But what I found most interesting about this particular retelling is that while you’ve got all your usual villainous suspects and while they’re always in the background moving the story along, they’re kind of, well… background. Sometimes the biggest villain one can face is one’s own personal demons, and Scarlet is very much a character-driven story about facing one’s fears, coming to terms with the past, atonement, healing, and trust. The plot resolution… wow. Not where I was expecting this story to go, and I love that. I also love how while the novel resolved in a way that left me very satisfied, which is good because at this time, Scarlet is a standalone, but Gaughen left herself several plot threads to follow should she ever continue the gang’s adventures in Sherwood. Overall. 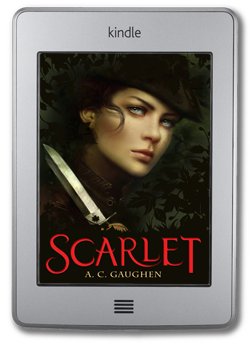 Classic and yet unique, A.C. Gaughen’s Scarlet captures the spirit, adventure, and romance of the Robin Hood legend while giving it her own wonderfully new and fresh twist. EDIT…A.C. Gaughen announced on her blog last week that it’s just been decided that Scarlet will be a trilogy!!! Woot! More info and a giveaway HERE. Ohhh glad to hear this is a good one! I’ve been wanting to pick it up for awhile now but haven’t had the time. I’ll definitely have to check it out soon! Thanks for sharing, great review! I know what you mean. Right now I’m overwhelmed by the books I must and want to read. Not enough hours in the day. < – Need a time-turner. Hope you get to read it soon! Thanks for visiting, Anna! It’s nice to hear such good things about Scarlet. It’s been on my list for awhile now, but I’ve been hesitating to pick it up because I wasn’t sure about it. Reading this review though, I think I will like it and will have to give it a try soon! I remember buying this one and holding off reading it for months and when I finally dove into I freaking loved it. I’m so glad to hear she will be making this a series. I know! I was satisfied enough with how it ended, but there’s so much potential for more there. SO EXCITED!!! I know, right?! Such AWESOME news! Cannot wait for the next one!!! Thanks for visiting and commenting, Mel! I really loved reading Scarlet! Thank you for sharing the news about this now becoming a trilogy. I am so excited to see what happens next! I know! Me too! This was such a fabulous book! Thanks for dropping in, Sandra! Yay! And I know what you mean. Sometimes I just crave a certain type of story. I hope you were able to get your hands on a copy! Great review. This one is new to me. What stopped me from reading this was her odd way of speaking. I’m sure it grows on you, but it seems so weird to me it took away from the first page or so and I decided not to read it. Thanks for the great review! Thanks to the awesome sales over the holidays I was finally able to pick this book up. Can’t wait to start reading! Yay for holiday sales!!! Yay for good books! I hope you enjoy it! I loved Scarlet! It was great to finally see someone focusing on the female in the story and not on Robin. I loved the change that it brought to the story and the sense of empowerment that it gave me. It’s a great book!!! Good review! Yes, I liked that it centered around a female character too. Gave it an interesting perspective and that period of history especially could use some female empowerment. Glad you enjoyed it too, and thanks for commenting, Megan! I love fairy tale retelling! I haven’t read Cinder yet but the series is on top of to buy list. I should get the books real soon! Yeah, I’ve been for the most part liking/loving the retellings I’ve read of late. Thanks for stopping by, Anne! This book sounds incredible! I love retellings of classic stories, especially some of the ones I’ve read recently (hello, For Darkness Shows the Stars), and from you review, these characters sound extremely well thought-out and multifaceted, which is always a must for a really great book. Definitely going to read this one soon!! Scarlet is pretty awesome with pretty great characters I hope you get the chance to check this one out soon! I’ve been hesitant to read this because most of the reviews I’ve read are either really good or really bad. The subject is so interesting, though, I think I’ll give it a try. I wonder if people didn’t like it because of Scarlet’s strange way of speaking? Interesting. I hope you do give it a try regardless! Thanks for commenting, Kate!